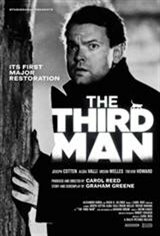 An unemployed pulp-fiction novelist, Holly Martins (Joseph Cotten), travels to post-WWII Vienna, where he accepts a job offer from his former classmate, Harry Lime (Orson Welles). When Harry is a no-show at the train station, Holly begins to get suspicious about his whereabouts. Holly discovers his classmate was involved in a traffic accident prior to his arrival. Not convinced that his death was a freak accident, Holly digs through the rubble of Vienna and the lies of friends to find the truth about what really happened to Harry Lime.